Federal privacy laws haven’t been updated since 1986, and cellphones, the Internet and GPS technology have raised a host of new issues. AUGUSTA — Privacy protections have a long history but haven’t kept pace with technology, experts said at a forum on Tuesday. Privacy protections for a person’s home date back to ancient Rome, said Robert Bernheim, a UMA history professor and human rights scholar. Later, the British government’s use of general or even permanent search warrants in the American colonies caused resentment and led to the inclusion of the Fourth Amendment in the Bill of Rights, he said. Still later, legal precedent extended the amendment’s protections to the privacy of individuals, in addition to property, and to actions taken by state and local governments, instead of just the federal government. Shenna Bellows, executive director of the America Civil Liberties Union of Maine, said federal privacy laws haven’t been updated since 1986, and cellphones, the Internet and GPS technology have raised a host of new issues. Joseph Szakas, UMA’s provost, who also teaches a course on computers and culture, said intelligence and law-enforcement agencies quickly started intercepting communications as new media emerged. Now, he said, people are voluntarily — if often unwittingly — sharing information about themselves via apps, search engines and credit card use. “It’s not that things were created to be evil; it’s that we found uses for it that started on a slippery slope that was really hard to stop because of the computers’ power and effectiveness,” Szakas said. Szakas said revelations about the National Security Agency’s surveillance of phone calls and the Internet aren’t surprising. Bellows said they’ve nonetheless brought more attention to issues the ACLU has been raising since passage of the Patriot Act in 2001. Bellows said the country is at a potential turning point, and people need to decide whether they’ll cede their privacy rights or assert them by pushing back on surveillance. About 30 people attended the forum in the Randall Student Center. Audience members who spoke expressed dismay about infringements on privacy and pessimism that ordinary citizens can do much to push back against the government. “How can you have a fair system when the entire deck is literally being stacked against us, law by law?” one woman asked. Bellows said the ACLU is pushing for more transparency in the U.S. Foreign Intelligence Surveillance Court, which oversees surveillance warrants and operates mostly in secret. It also has been promoting legislation on the state level, such as new laws requiring state and local police to secure warrants before obtaining cellphone location information or text messages or placing cameras on private property. 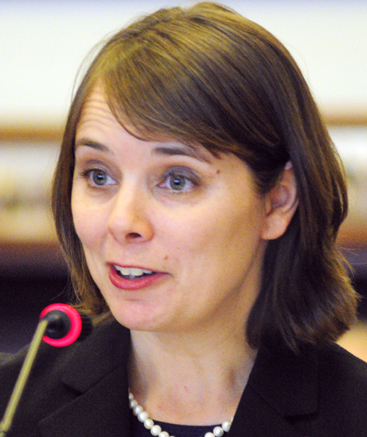 Bellows said the ACLU of Maine lobbied legislators heavily, enabling easy passage of two of the laws and an override of Gov. Paul LePage’s veto of the third. “I’ll be honest with you. Your communications are not protected from NSA surveillance, but they are protected from state and local police, which might have more impact on your everyday life,” Bellows said.